Nigeria has the largest population and the largest economy in Africa. The area of present-day Nigeria has been home to a number of ancient and indigenous kingdoms and states over the millennia, with the modern state originating from British colonial rule beginning in the 19th century. After it gained independence from British colonialism in 1960, Nigeria saw civil war from 1967-70, and military rule from 1970-99, since when there has been multi-party democracy. Localised unrest continues to impede infrastructure development in some areas. Much of Nigeria’s economy depends on oil revenues from fields in the south of the country. About one third of Nigerians are employed in agriculture. The service sector is large, particularly telecommunications and financial services; and manufacturing industry is growing. Nigeria has extensive mineral resources, but the mining industry is still small. Nigeria has extensive surface water resources, including the perennial Niger and Benue rivers and their tributaries. Groundwater is widely used for domestic, agricultural and industrial supplies. Most rural areas are dependent on groundwater, and a number of towns and cities. Please cite this page as: Tijani, Crane, Upton, Ó Dochartaigh and Bellwood-Howard, 2018. Nigeria. Map developed from USGS GTOPOPO30; GADM global administrative areas; and UN Revision of World Urbanization Prospects. For more information on the map development and datasets see the geography resource page. 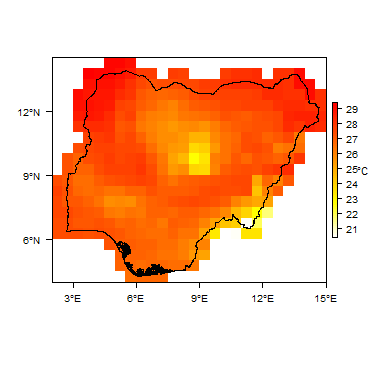 Nigeria's climate is highly variable, from tropical in the south to semi-arid in the north. Temporal variations in temperature and rainfall are illustrated by the graphs below. 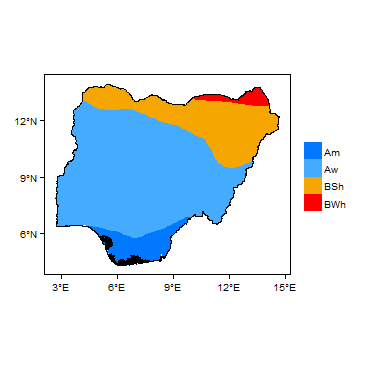 More information on average rainfall and temperature for each of the climate zones in Nigeria can be seen at the Nigeria climate page. The main rivers in Nigeria are the Niger and the Benue, which converge and flow together into the Niger Delta, one of the world's largest river deltas. There are both national and regional bodies responsible for river flow gauging and data storage. The Nigeria Hydrological Services Agency (NIHSA) is responsible for assessment of surface water resources through collection of data such as river stage, discharge, water quality and sediment transport. NIHSA maintain a nation-wide network of hydrological stations. The Niger Basin Authority (NBA) is also involved in river flow gauging of the River Niger at 18 stations in Niger, and store the data at their headquarters in Niamey, Niger Republic. The Lake Chad Basin Commission gauges river flow at 2 stations on the Komadugu–Yobe River in the Chad Basin Catchment. The Power Holding Company of Nigeria (PHCN) also maintains river flow gauging stations along the River Niger at Kainji and Jebba; they hold these data for use in operating their hydropower systems. 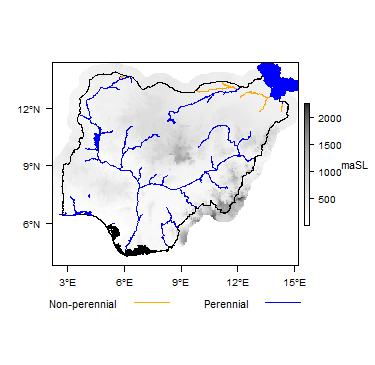 Major surface water features of Nigeria. Map developed from World Wildlife Fund HydroSHEDS; Digital Chart of the World drainage; and FAO Inland Water Bodies. For more information on the map development and datasets see the surface water resource page. 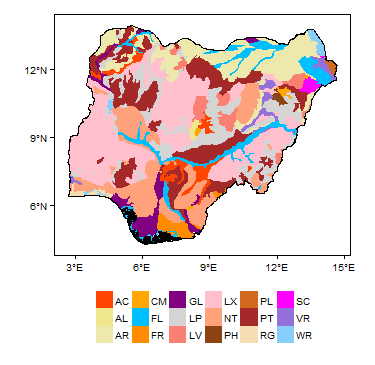 Soil Map of Nigeria, from the European Commission Joint Research Centre: European Soil Portal. For more information on the map see the soil resource page. Nigeria has highly variable land cover, including tropical rainforest, Sahel savanna, mountain plateaus and coastal plains. 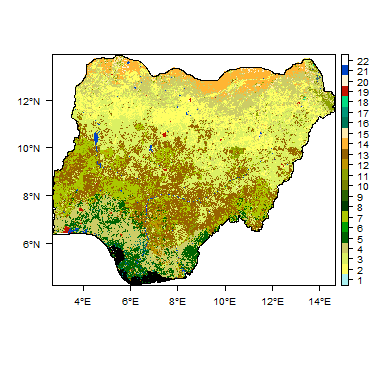 Land Cover Map of Nigeria, from the European Space Agency GlobCover 2.3, 2009. For more information on the map see the land cover resource page. The following section provides a summary of the geology of Nigeria. More detailed information can be found in the key references listed below: many of these are available through the Africa Groundwater Literature Archive. Geology of Nigeria at 1:5 million scale. Developed from USGS map (Persits et al. 2002). For more information on the map development and datasets see the geology resource page. Alluvium Quaternary Deposits vary in thickness and lithology, with sands, gravels, silt and clay all present in varying proportions. These occur along the main river valleys and are thickest (15 - 30 m thick) in valleys associated with the rivers Niger and Benue (Adelana et al. 2008). Chad, Kerri-Kerri and Gombe formations Cretaceous - Quaternary The dominant lithologies in the Chad Basin, in the northeast of Nigeria, are sandstone, siltstone and shale. The Quaternary age Chad Formation is up to 840 m thick and consists of poorly sorted fine to coarse-grained sand, with sandy clay, clay and diatomite (Adelana et al. 2008). The Tertiary age Kerri-Kerri Formation consists of lacustrine or fluvio-lacustrine loosely cemented cross-bedded coarse- to fine-grained sandstones, with locally occurring claystones, siltstones, ironstones, lignites and conglomerates. It rests unconformably on the Gombe Sandstone Formation, and thickens towards the centre of the Chad Basin, where it is overlain by the Chad Formation (Adelana et al. 2008). The Cretaceous age Gombe Sandstone Formation consists of estuarine and deltaic sediments, deposited on marine shales with sandstone/shale intercalations. The lower deposits of siltstone, mudstone and ironstone are overlain by well-bedded sandstones and siltstones. The upper part of the formation contains coals and cross-bedded sandstones (Adelana et al. 2008). Unconsolidated: Deltaic Formation Tertiary - Quaternary Tertiary to Quaternary unconsolidated sediments at the top of the Niger Delta Basin sequence comprise coarse to medium grained unconsolidated sands and gravels with thin peats, silts, clays and shales (Adelana et al. 2008). Benin, Agbada and Akata formations Tertiary There are three main deeper sedimentary formations in the Niger Delta Basin. The oldest is the Akata Formation, and is predominantly shaly, with sandstone lenses in the upper parts. The Agbada Formation is predominantly sandy in its upper part, with shale and sandstone beds in roughly equal proportion in its lower part. It may be over 3000 m thick in places, and contains petroleum. The youngest is the Benin Formation, which comprises predominantly (over 90%) sand and gravelly sandstone with shale and clay intercalations. The Niger Delta sedimentary rocks are over 10 km thick in total. Sokoto Group (Gwandu, Kalambaina and Dange formations) Tertiary Nigeria's Sokoto Basin represents the southeastern part of the Iullemmeden basin, which stretches across parts of Mali, Niger, Benin and into northwest Nigeria. The Tertiary rocks of the Sokoto Basin are mostly interbedded sandstones, clay and some limestone (Pavelic et al. 2012). The Gwandu Formation (of Eocene-Miocene age) crops out in the west of the Sokoto Basin and comprises interbedded semi-consolidated sand and clay. It unconformably overlies the Kalambaina Formation in the north and centre of the basin (Adelana et al. 2008). The Kalambaina Formation consists of clayey limestone with modular crystalline limestone, and is underlain by the Dange Formation, a marine clay shale. The Kalambaina and Dange Formations are collectively known as the Sokoto Group and are of Paleocene age (Adelana et al. 2008). Nupe, Patti and Lokoja sandstones Cretaceous The Nupe Basin is alternatively known as the Bida or Niger Basin. The basin contains largely continental sandstones, siltstones, claystones and conglomerates (Adelana et al. 2008). Bima Sandstone Tertiary The Upper Benue Basin consists of a thick succession of continental sandstones overlain by marine and estuarine shales and limestones. The basal formation is the Bima Sandstone (Adelana et al. 2008). Younger granites Jurassic An-orogenic volcanic and hypabyssal rocks emplaced within the Precambrian Basement Complex. Arcuate to circular intrusions forming ring-like complexes. Migmatite-Gneiss Complex (quartzites, amphibolites, marble) Liberian (ca 2800 Ma) to Pan African (ca 600 Ma) These rocks are found in the north-central area of Nigeria, including the Jos Plateau, and in the southwest of Nigeria. They comprise gneisses, migmatites, granites, schists, phyllites and quartzites (Adelana et al. 2008). Metamorphism is in the amphibolites facies range. Older Granites Upper Proterozoic Intruded into the migmatite-gneiss complex and the schist belts. 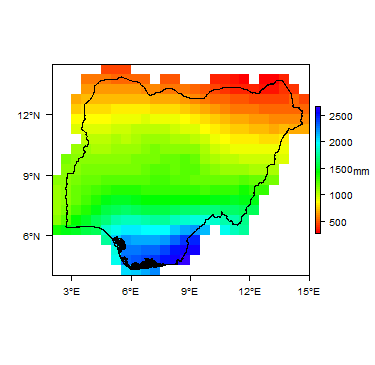 This section provides a summary of the hydrogeology of the main aquifers in Nigeria. More information is available in the references listed at the bottom of this page. Many of these references can be accessed through the Africa Groundwater Literature Archive. Niger Delta Basin: Deltaic Formation, Benin Formation The unconsolidated aquifers of the Niger Delta Basin are extensive and high yielding. The upper Deltaic Formation is unconsolidated and largely unconfined with shallow water table (0-10 m below ground level) (Offodile 2002). The older Benin Formation is partly consolidated. It is largely unconfined, but locally confined by lower permeability beds. Water table is typically between 3 and 15 m below ground level (Offodile 2002), but can be as much as 55 m deep. The aquifers can provide yields from 3 to 60 l/s. Borehole depths range from 10 to 800 m.
None Salinity problems arising from sea water intrusion; iron problems; pollution problems. Recharge is mostly from direct rainfall. Volcanic rocks, including basalts Igneous volcanic aquifers provide low to moderate yields, usually below 3 l/s. These aquifers are typically unconfined, with typical variations in water table depth of less than 5 m. Aquifer thickness varies substantially, and borehole depths of 15 to 50 m are common. None Water quality is generally good. Direct rainfall recharge. Chad, Kerri-Kerri and Gombe formations The Chad Formation can be unconfined or confined depending on local conditions. Deeper sandstone layers are often confined and can be artesian. Yields of between 2.5 and 30 l/s are quoted. The water table depth is often between 10 and 15 m (Offodile 2002). The Gombe Sandstone has relatively low permeability, usually providing yields of about 1 to 5 l/s. Relatively little is known about the Kerri-Kerri Formation at depth. None Water quality is generally good. Recharge is mainly by infiltration from rainfall. Sokoto Group (Gwandu and Kalambaina formations); Rima Group (Wurno, Dukamage and Taloka formations); Ilo/Gundimi Formation The lower sands of the Gwandu Formation are often confined; upper layers are unconfined. Water table can vary from 20 to 100 m depth. Storage is typically high. The Kalambaina Formation is locally permeable with perched aquifers in sandier layers (Offodile 2002). The sand layers of the Wurno Formation are moderately yielding, with a restricted recharge area. The Taloka Formation provides variable yields. It is sometimes confined by clay layers (Offodile 2002). The gritty, conglomeratic and gravel layers of the Ilo/Gundumi Formation act as aquifers, often confined by clayey layers at depth, when artesian conditions can occur. Shallower aquifer layers are usually unconfined. Typical yields are 2 to 8 l/s. Variable transmissivity values have been quoted, from less than 10 to nearly 1000 m²/day (Offodile 2002). Bima Sandstone, Yolde Sandstone These formations have relatively low permeability and usually provide poor to moderate yields of about 1 to 5 l/s. They vary substantially in thickness. The water table depth is usually between 60 and 165 m. Boreholes range in depth from 30 to 300 m. None Water quality is generally good. Recharge is mainly by infiltration from rainfall. Makurdi, Keana, Ezeaku, Awe and Asu River Group formations These formations tend to be indurated and dominated by fracture flow (although the Makurdi Sandstone is less so). Typical yields are around 2 to 8 l/s, but wide variations are seen, depending on the degree of fracturing and deep weathering. The aquifers therefore tend to be localised, and vary greatly in thickness. They are usually unconfined with the water table at about 10 - 40 m depth. Boreholes are typically 40 - 150 m deep. None Water can be highly mineralised. Direct rainfall recharge. Basement aquifers Basement rocks can form local aquifers if the degree of weathering and/or fracturing is sufficient. Crystalline and coarse-grain rocks, such as gneiss and migmatite, become sandy on weathering, thus preferentially forming aquifers. Argillaceous meta-sedimentary rocks tend to be become clayey with low permeability when weathered, forming aquitards. Overall, basement aquifers tend not to be high yielding. They typically vary in thickness from 10 to 25 m, with water table depth varying from about 5 to 15 m. Boreholes tend to be drilled to depths between 10 and 70 m, depending on local conditions. None Water quality is generally good. Direct rainfall recharge. The total renewable groundwater resources potential in Nigeria is estimated at 155.8 billion cubic metres per year (BCM/year), derived from estimated total annual groundwater recharge (JICA 2014). Recharge is variable across Nigeria, controlled largely by climate. For example, in northern Nigeria, recharge is low, due to low rainfall and high evapotranspiration. There are local issues of over-abstraction of groundwater, causing lowering of groundwater levels and, in some cases, land subsidence. These are mainly in unconsolidated aquifers in urban areas in the coastal plain in the south, including in Lagos and Port Harcourt (Ministry of Water Resources 2013). There are issues with drought causing lowering of groundwater levels, both seasonally in dry seasons, and during longer term periods of low rainfall. This is particularly an issue for local, low storage basement aquifers, both in the north where rainfall is low and in the south, where rainfall is high (Ministry of Water Resources 2013). The potential impact of climate change on groundwater levels, with changing climate patterns combined with changing water demand, is recognised in the National Water Resources Master Plan (Ministry of Water Resources 2013). Naturally highly mineralised groundwater occurs in the Awe Formation sedimentary aquifer in the Benue basin. There are reports of sea water intrusion into southern coastal aquifers, due to lowering of groundwater levels following over-abstraction (Ministry of Water Resources 2013). There are reports of local contamination of groundwater in the Lagos area by industrial chemicals. There are also reports of metals contamination of groundwater from mining activity (Ministry of Water 2013). There is interaction between the River Niger and sedimentary aquifers in the Sokoto Basin. Groundwater is widely used in Nigeria for domestic, agricultural and industrial purposes. The cities of Calabar (coastal southeastern Nigeria) and Port Harcourt (capital of Rivers State, south Nigeria) are totally dependent on groundwater. In 2013 there were around 65,000 boreholes or other groundwater points in Nigeria, extracting an estimated total of 6,340,000 m³/day (JICA 2014; Ministry of Water Resources 2013). Most are used for water supply in rural areas and for small towns (Ministry of Water Resources 2013). Rural water supply boreholes are usually installed with hand pumps, which have a maximum pumping capacity of 10 m³/day (Ministry of Water Resources 2013). A 1996 survey by the Ministry of Water Resources found only 63% of Nigerian boreholes were in working order, with many out of action due to pump failure (JICA 2014). This is related to the management structure for boreholes: most are meant to be managed by communities, but only around one fifth of rural communities were identified as having borehole management organisations, so that actual management, including restoring non-operational boreholes, is not optimum (Ministry of Water Resources 2013). The National Water Resources Institute, a parastatal of the Federal Ministry of Water Resources, has responsibility for training, research and data management relating to water in general. All the River Basin Development Authorities, which are also parastatals of the Federal Ministry of Water Resources involved in the provision of water supply to rural environments within their catchments. The Nigerian Association of Hydrogeologists (NAH) is the professional body concerned with due process and best practices in the exploration, development and management of Nigeria’s water resources. The NAH disseminates information on the state of the nation’s water resources through annual conferences and a journal, Water Resources. Through membership of the Hydrology and Hydrogeology Subcommittee of the National Technical Committee on Water Resources (NTCWR), the technical arm of the National Council of Water Resources (NCWR), the NAH contributes to the development of water resources policies and legislation, including the Water Resources Act 100 and the Nigerian Standard for Drinking Water Quality, and is currently involved in their review and/or implementation. Legislation has been developed, including the Water Resources Decree 101 promulgated in 1993 (now referred to as Water Resources Act 100), but is under review and awaiting enactment. The 2004 National Water Policy aimed to decentralise management of water to the most local government unit possible and to maximise user participation in planning and management , with central government retaining overall control of water governance. The Nigeria Hydrological Services Agency (NIHSA), an agency of the Federal Ministry of Water Resources, has responsibility for groundwater monitoring. There is a national groundwater level monitoring programme with 43 monitoring points, 32 of which are equipped with data loggers. These are sited in basement and sedimentary aquifers. The frequency of monitoring at sites with data loggers is daily, and sometimes twice daily. NIHSA has implemented a programme of drilling new monitoring boreholes for monitoring groundwater level. The new boreholes so far are focussed on sedimentary aquifers used for urban water supply; with borehole depths of 80 to 100 m (Ministry of Water Resources 2013). The groundwater level monitoring data are stored at NIHSA headquarters in Abuja. The NIHSA is also responsible for water quality monitoring, but as yet a full programme is not in place due to lack of equipment. The National Water Resources Master Plan recognises current problems in the effective aquisition and management of groundwater data, and recommends strategies for improving this situation (Ministry of Water Resources 2013). Groundwater could contribute to increasing future water demand by upgrading existing borehole infrastructure, switching from hand pumps to motorised pumps (JICA 2014). contamination of groundwater resulting from sea water intrusion and infiltration of domestic and industrial contaminants. The Iullemeden, Taoudeni/Tanezrout Aquifer Systems (ITAS), shared by Algeria, Benin, Burkina Faso, Mali, Mauritania, Niger and Nigeria. The Chad Basin Aquifer, shared by Cameroon, Central African Republic, Chad, Niger and Nigeria. The Keta Basin Aquifers, shared by Ghana, Togo, Benin and Nigeria. The Rio Del Rey Basin, shared by Cameroon and Nigeria along the coast. A mechanism for the management of the Iullemeden aquifer is in development, as Nigeria has just ratified an Agreement. The Lake Chad Basin Commission manages issues on the Chad Basin. Groundwater management activities on other Basins are yet to commence. Many of the references below, and others relating to the hydrogeology of Nigeria, can be accessed through the African Groundwater Literature Archive. Adelana SMA, Olasehinde PI, Bale RB, Vrbka P, Edet AE and Goni IB. 2008. An overview of the geology and hydrogeology of Nigeria. In: Adelana, S.M.A. and MacDonald, A.M. Applied Groundwater Studies in Africa. IAH Selected Papers in Hydrogeology Volume 13. Taylor & Francis, London, UK. Mpamba NH. 2006. Comparative Analytical Model for Groundwater Monitoring in the Urban and Rural areas of Zambia – Groundwater Resources Data and Information . The University of Zambia, Lusaka, Zambia. Rahaman MA and Malomo S. 1983. Sedimentary and crystalline rocks of Nigeria In: Ola, S. A. Ed. Tropical soils of Nigeria in Engineering Practice. Rotterdam. Balkema. Kogbe CA. 1976. Microbiostratigraphy of lower Tertiary sediments from the southeastern flank of the Iullemeden basin, N.W. Nigeria. In: Kogbe C. A. (Ed.). 1976. Geology of Nigeria. Elizabethan Publishing Company, Lagos, Nigeria. Obaje NG. 2009. Geology and mineral resources of Nigeria. Springer. Capstick S, Whitmarsh L, Healy A and Bristow G. 2017. Resilience in Groundwater Supply Systems: Findings from a survey of private households in Lagos, Nigeria. RIGSS working paper, Cardiff University, UK. Dabi, DD. 2004. Assessing the Vulnerability of Fadama (Floodplain) Agriculture to Climate Variability and Change: A Case Study of Semi-Arid Northern Nigeria. Advanced Institute on Vulnerability to Global Environmental Change, Laxenburg, Austria. Federal Republic of Nigeria. 2004. National Water Policy. Kogbe CA (Ed.). 1976. Geology of Nigeria. Elizabethan Publishing Company, Lagos, Nigeria. Longe EO, Omole DO, Adewumi IK and Ogbiye SA. 2010. Water resources use, abuse and regulations in Nigeria. Journal of Sustainable Development in Africa, 12(2), 35-44. Ministry of Water Resources. 2013. National Water Resources Master Plan. Offodile ME. 2002. Groundwater study and development in Nigeria. Mecon Services Ltd, Jos, Nigeria. Takeshima H, Adeoti A and Salau S. 2009. Transaction costs and investment in irrigation pumps: Evidence from Nigeria. International Food Policy Research Institute (IFPRI). Wardrop Engineering Consultants. 1985. 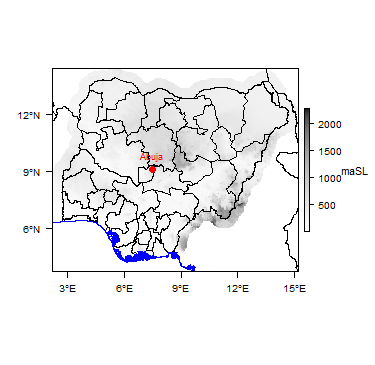 Bauchi State hydrogeology, Hydrogeology Map 1:500000. In : Bauchi State Agricultural Development Programme. Borehole project final report. Wardrop Engineering Consultants, 1985. This page was last modified on 20 February 2019, at 18:43.